What started out as a possibly altruistic idea of going into small towns in the South where it was difficult to staff schools and instead bring in lightly trained recent college graduates to populate the classrooms, has now become a multimillion dollar business relying on charter schools to use these recruits to staff their charter franchises. These recruits contract with TFA, Inc. for two or three years then most move on to graduate school, law school or another chosen profession leaving schools and creating churn. Another aspect of this that is overlooked is that with the new teacher evaluation system that is being pushed by Arne Duncan and his army of privatizers, the performance of the TFA, Inc. recruits will never be evaluated over time so there would be a steady stream of these young people teaching under the radar of the evaluation system. Wendy Kopp charges school districts anywhere from $4,000 to $10,000 per recruit each year for the “privilege” of having her recruits staff the most under-performing and impoverished schools or charter schools that do not hire union teachers. And what does Wendy Kopp make each year from her endeavor to staff our schools with recruits after 5 weeks of “training”? We can take a look at her 990 form, the form that is submitted by tax exempt organizations, to get an idea. According to the tax form that was submitted for 2009, at the end of that year there was a sum of almost $300M in net assets for TFA, Inc. Most of this cash came from wealthy donors such as Eli Broad and the Gates Foundation. If that wasn’t enough, in 2010, Arne Duncan, through the Department of Education, provided Ms. Kopp with a $50M grant to help her teach the most impoverished children in our country. To explain this a bit, Wendy Kopp is on the Broad Foundation board. Arne Duncan who has close ties with Eli Broad from his days in Chicago as CEO of the Chicago school district, keeps the “Broad Prize” in the offices of the Department of Education, are you starting to see how this all works? In a previous post, you can see that Ms. Kopp then charges the school district for the training of these recruits as clearly described in the contract that she has with the Seattle Public School system but at the same time, she considers that as an expense on her tax form. Ms. Kopp paid herself that year a little over $375,000 and along with her staff, the total came to over $2M. Not too shabby for a “non-profit”. My name is John Bilby and I was a TFA teacher in the New York region from September 2009 until March 2010. I left the organization because I felt that it does not adequately prepare its people to serve the poorest children in public schools. I also think that TFA is more interested in power, access, and influence in the federal game of education than it is concerned with resolving educational inequity. Its “corps members” are merely a means to this end, providing the organization with a front while it pursues the goals of its donors, namely to remodel public education in this country in order to favor a high-turnover, non-unionized workforce in charters run by hedge-fund managers for tax breaks. I foresee this further stratifying our current system into one in which children with disabilities, children who don’t speak English, and children who do not do well on standardized tests are funneled into substandard schools in a constant state of crisis due to continuous budget cutting. I still believe, however, in the democratic power of education and the right of the people to vote out those who might infringe upon it. I am beginning a traditional route teacher certification program and I am looking forward to getting back into a city classroom soon. 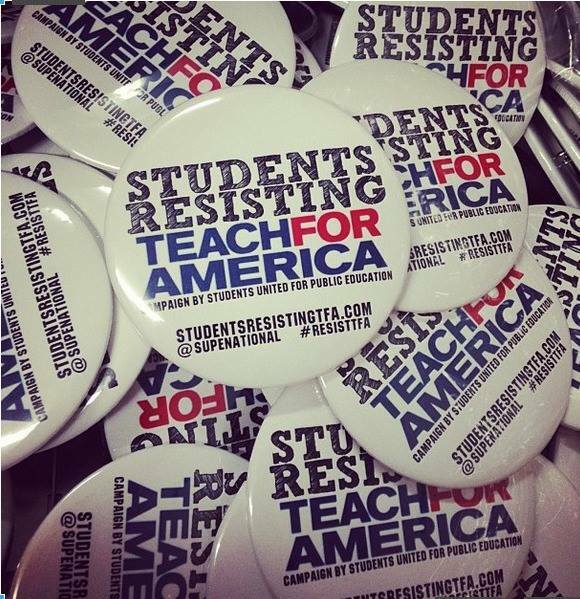 Money From Donors, iPads for Free: How Is it That Teach For America’s Struggling Corps Are Broke? John Thompson: How Can Teach for America Stop Making Enemies? Pingback: We are losing talented, dedicated and experienced teachers and here’s why | pgcps mess - Reform Sasscer without delay.